Eligibility: Open to all USA Swimming registered athletes. Athletes shall compete at the age attained on the first day of the meet. Warnings: Any club that enters an unregistered or improperly registered athlete, falsifies an entry in any way, or permits an unregistered coach to represent them, will be fined the sum of $100.00 and no further entries will be accepted from that club until the said fine has been paid. Rules: Current USA Swimming rules shall govern the meet. All events are times finals. A contestant may enter no more that four (4) individual events per day. Supervision Coaches are responsible for the conduct of their swimmers and families. Team areas are to be cleaned after each session. PLEASE RECYCLE! Admission: There is no admission charge. Programs for each session will be available for $2.00. Working officials and coaches receive a free session program. 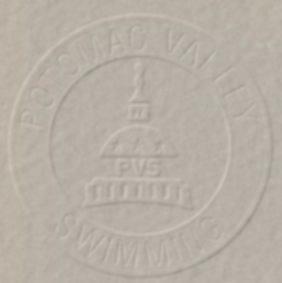 All PVS/USA Swimming registered coaches and deck officials are required to wear current USA Swimming membership credentials on the deck area. The Referee will ask anyone not displaying proper credentials to leave the deck area. Fees: Fees for individual events are $5.50, relays are $11.00. Each Club is requested to remit one check to cover the entry fees for the entire team. All meet fees are due with the meet entries. Officials: Certified officials who wish to work at this meet should contact Scott Witkin at scottwitkin@verizon.net. Please include your club affiliation, certifications held, and sessions you wish to work. Officials volunteering should sign in at the recording table prior to the start of Warm-ups. Certified officials who have not previously advised of their availability may volunteer their services to the Referee. Timers: Participating clubs are required to provide timers in proportion to their entries. The Meet Director will determine the number of timers per club and lane assignments. The host club is required to provide one timer per lane. Awards: INDIVIDUAL EVENTS: Medals will be awarded for first through eighth place. Ribbons will be awarded 9th to 16th place. * *Participation ribbons will be given to all swimmers. RELAY EVENTS: Medals will be awarded for first through eighth place. Ribbons will be awarded 9th to 16th place. ATTENTION COACHES AND SWIMMERS: Team trophies will be awarded the top three scoring teams at the conclusion of the meet. · Commlink II files should include include both individual entries and relay teams. · **A Meet Entry Report by swimmer and Meet Entry Report by event from the Team Manager Program and saved in the "word" format. **Your entry will not be accepted if these reports are not with your commlink files. · A phone number and e-mail address (if available) at which a club point of contact will be readily accessible must be included with the entry for validation of entries. · Teams submitting their entries electronically shall submit their meet fees. If you do not have these cards, they will be provided for you at the meet. Reminder: Any team that enters more than 10 swimmers and does not use Hy-Tek, will incur a surcharge of $1.00 per swimmer. Checks should be made payable to: MCRD (Montgomery County Recreation Dept.). Do not send CASH. Please note your club name on the check.